The chicken turtle is one of the uncommon species of turtle which are mostly found in the southeast of the United States. Their scientific name is Deirochelys Reticularia as they belong to the subfamily of the species commonly known as deirochelyiane. The name “chicken” is a reference to the taste of their meat. They are commonly sold in southern markets. Chicken turtles are divided into three different species which are located at different locations on the southeast side of the United States. The first species are commonly found in places from Virginia to Texas and north into Oklahoma and Arkansas. The second species is known as D. r. chrysea is found in the suburbs of Florida, and the third species are the eastern D. r. reticularia and western D. r. miaria. They are sometimes referred to as “American snake necks” due to their long and striped necks which are almost the same size as their shell. The turtles are medium-sized, and the adults can reach to be around 25 cm long. The shells of these turtles have a net-like pattern on it, and the webbed feet make it very easy for them to swim in water. Female chicken turtles are larger than the males, but the male turtles have thicker tails and a more compressed shells then the female. They usually have yellow stripes on their front and rear legs. Chicken turtles typically live to about 15 to 20 years. Chicken turtles are omnivores which means that they eat both plants and animals. Although they are somewhat considered as carnivores and during the first year of their lives, they are complete carnivores, but they still eat plants. These turtles love to eat crayfish, fish, aquatic insects, frogs, tadpoles and leafy greens. Their well-developed hyoid apparatus helps them to easily push food down their throats by creating a suction which is one of the very unusual phenomenons found in these species. These turtles are considered semi-aquatic, which means that they can live on both land and water. They are mostly found on land and can be seen migrating between aquatic habitats and trying to find soil burrows in order to escape dry conditions. 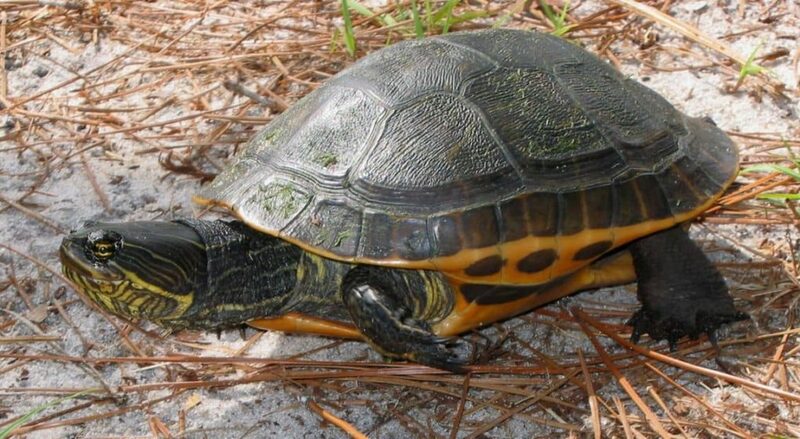 Chicken turtles can be found in canals, marshes or any other types of still water areas, but since they prefer to live on land more, they are habitually found in sandhills. If they want to live in water, then they prefer the ones with dense vegetation and soft layer underneath. Males move generally further than females during migration. 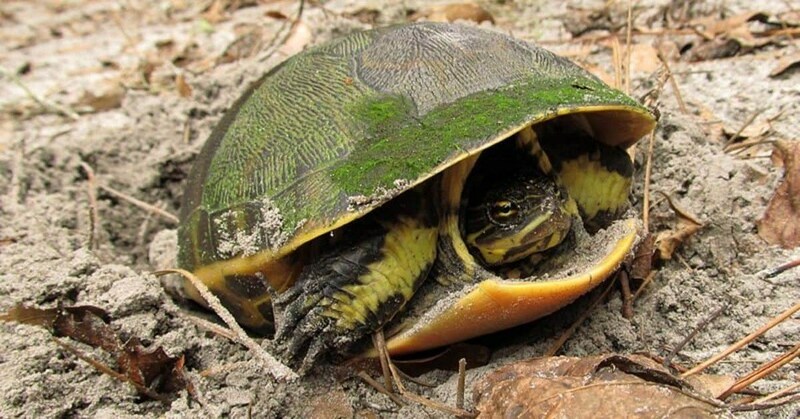 This South Carolina turtle’s activity found on land is mostly in the months of March and April while the Florida turtles are more active throughout the year and most come out during the day time. They are considered to be both prey and predators due to their omnivorous behavior. They typically feed on fish, tadpoles, frogs, etc. Their predators like eastern moles are a potential threat to their nests since they can dig into their nests. Raccoons are other Native American mammal posing a threat to the chicken turtles due to their large size and heavy body weight. Snapping turtles are also considered to be a potential predator of the chicken turtles. Chicken turtles are not considered an endangered species because their population is currently stable throughout their range although some species like western chicken turtles are considered endangered. But still, they face some serious situations that might reduce the number of species. Destruction of their habitats might reduce create a challenge for their migration and ability to hibernate. People are the issue in this case with development. Another risk is that people catch and sell them in some Southern markets for their meat. The reproduction of chicken turtles takes place when the male turtles vibrate their foreclaws on the female’s face. If the female is responsive and friendly towards this, then they might start to mate. Nesting season begins either in fall or winter unlike other North American turtles and the egg-laying season takes place either during early spring or early winter. Temperature is very important for the nesting of chicken turtles and the hatching of eggs starts at around 152 days at a temperature of 84 degrees fahrenheit (29 degrees Celsius). If you have or want a one of these turtles, you can make indoor and outdoor enclosures for them which contain fresh water and nearby basking areas. For an indoor enclosure, you can use a 75 to the 125-gallon tub with a proper filtration system and UVB light shining from above. For outdoor enclosures, you can use a pond and set up a suitable environment for their hibernation. Let us know in the comments section about your pet turtle and what special care you provide to them.